Perennial English rivals, Manchester United and Chelsea face off in the biggest match of their respective seasons in the FA Cup Final at Wembley on Saturday with both clubs aiming to finish what has been an underwhelming season with a flourish. Both clubs head into the showpiece off the back of some dodgy results in the past few weeks though United have a better record in the last two matches. The Reds are slight favorites for the clash but must be wary of a Chelsea team seeking redemption for a wretched season so far. Here are the 11 players that could start the game for Manchester United. Chelsea will definitely be wishing that Spanish shotstopper, David De Gea misses this game somehow. The goal custodian has had another wonderful campaign in goal for United, and will be hoping to secure another trophy in his time with the club. At right back, Antonio Valencia will be hoping to help United bomb the Chelsea left side, a part of the Blues backline that Newcastle exploited last time out. The Ecuadorian cherishes games like this while at left back, Ashley Young, fresh from earning a place in England’s World Cup squad will be tasked with ensuring that the United backline is solid on the left. In the heart of defence, a partnership of Phil Jones and Chris Smalling is expected to be named by manager, Jose Mourinho who has seen the on-pitch understanding between the pair improve after a lot of matches together. Former Chelsea midfielder, Nemanja Matic will be hoping to get the better of his former club. The Serbian powerhouse has been a standout player for United this term, while alongside him should be the pair of Ander Herrera and Paul Pogba. Herrera will be tasked with the responsibility of man-marking Eden Hazard while Pogba will be looking to use his physicality to bully the Chelsea midfield just like he did in the 2-1 victory over the West Londoners at Old Trafford back in February. Jesse Lingard and Alexis Sanchez will be looking to continue their love affair with the national stadium as they have great recollections of playing in the famous stadium. 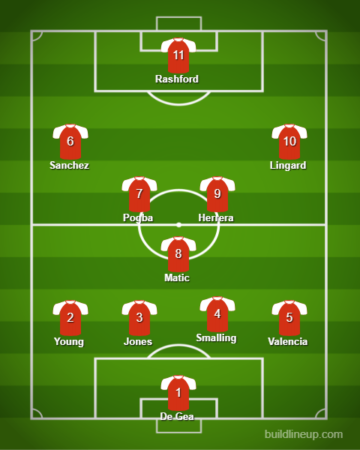 Lingard will be stationed on the right with Sanchez on the other flank while upfront, Marcus Rashford should get the nod as Romelu Lukaku doesn’t seem 100% for the game as he is still recovering from injury.